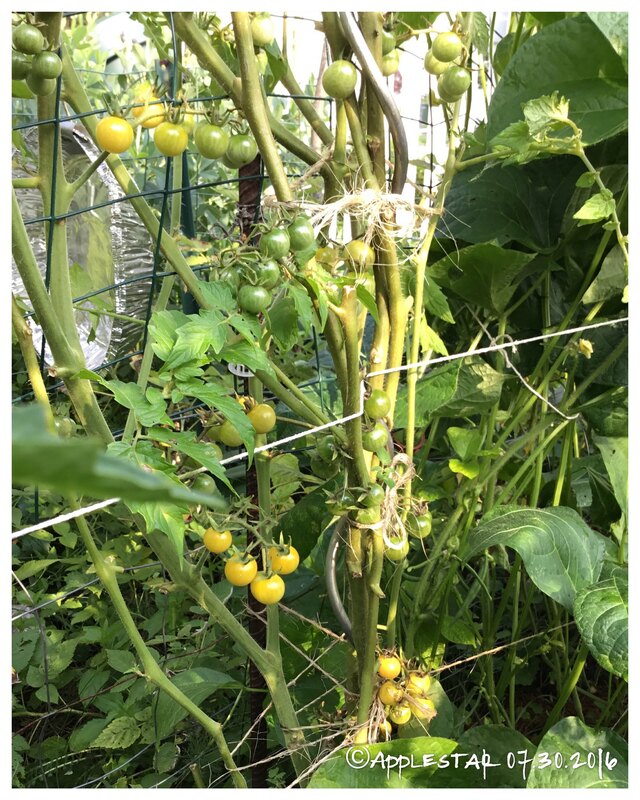 I was looking at those photos after posting and realized that the stupid bunny, who I'm sure was mowing down the adzuki beans and only accidentally ate the pepper plants, had also topped one of the the Gochugaru pepper above the fruit. 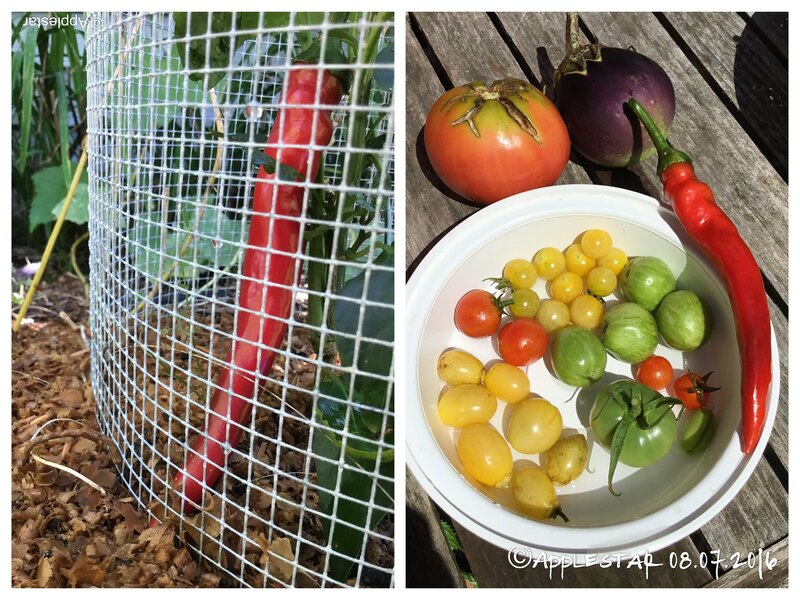 ...I wonder if the wire mesh would help to warm up the pepper plants. 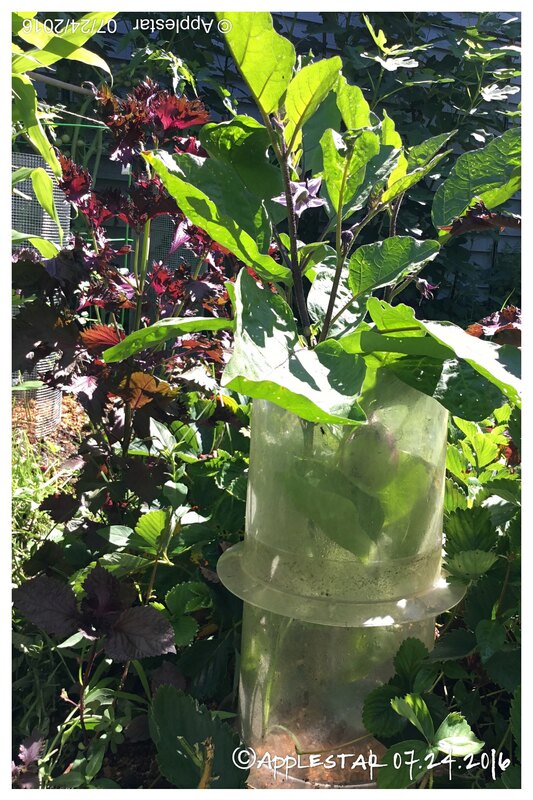 I might want to do the same for Kamo since it's outgrowing the re-purposed birdfeeder cylinder. 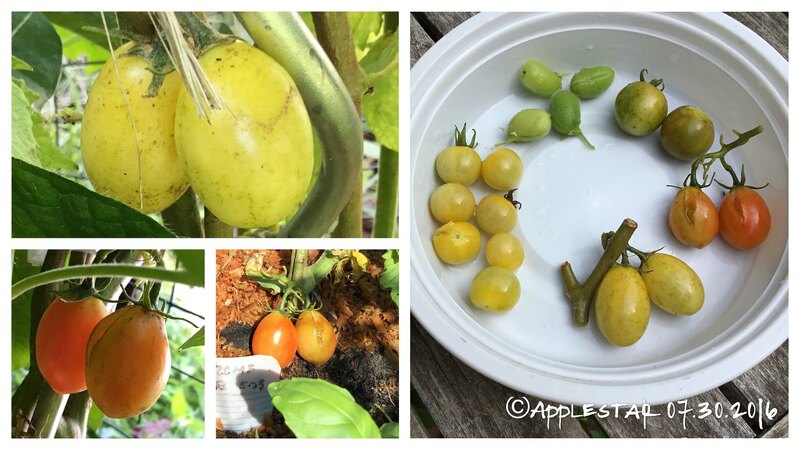 Also, 2nd Kamo eggplant and 2nd Fish Lake Oxheart which is not very Oxheart looking.... White grape cherry MRxCF.F2.1B.P1 (Maglia Rosa x Coyote+Faelan's First Snow) - size and shape varying on same plant, Red cherry MRxZM.F2.4B.P1 (Maglia Rosa x Zluta Kytice+Matt's Wild), White currant Coyote, green striped mystery volunteer plant died while fruits were green, red currant unID'd volunteer most likely Matt's Wild, green Berner Rose accidentally snapped off while trying to support. One green chickpea pod. ...I was a bit concerned that this might not be the right type because I had the impression that it was supposed to be somewhat shorter and blunter, but according to this, Mine seems be on the right track. This is from a store-bought seedling with no description to speak of except the name which translates to "peppers for Gochugaru" so I will save seeds but I don't know if the plant is a hybrid. 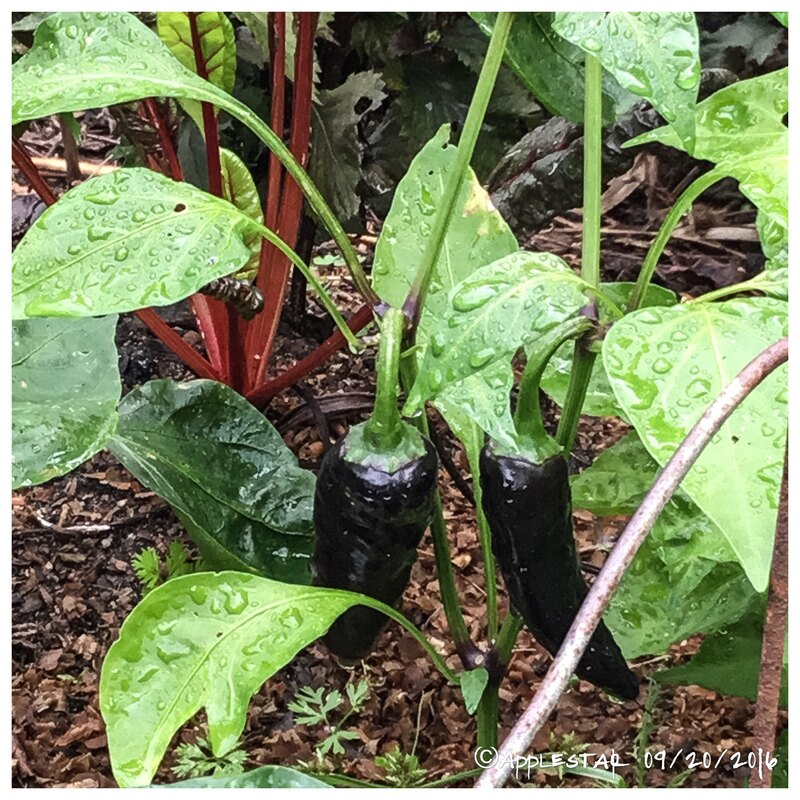 the peppers you want grow to be about 6 to 8 inches long. Gary'O Senna -- cross bred from Brandywine and Cherokee Purple -- my first time growing it. Bull's Heart originally from Duh_Vinci. This is the same overwintered plant. Someone told me the fruits that were harvested over last winter weren't wrinkly enough to be true Bhuts. 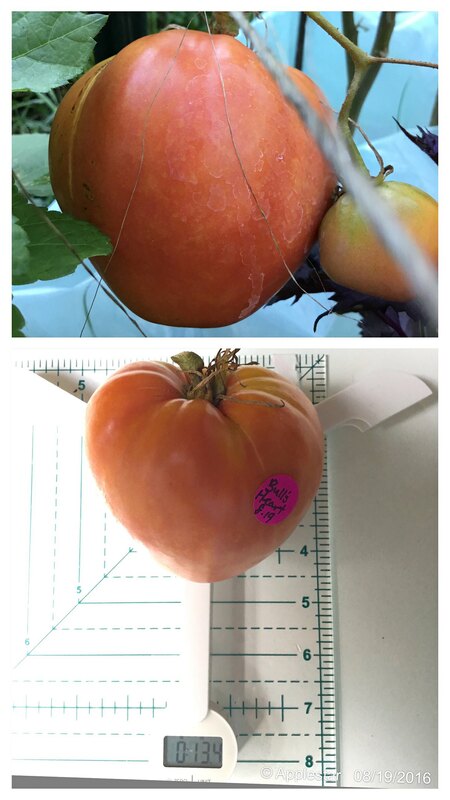 Do you think these summer outside fruits look a little different (wrinklier -- environmental difference -- more true to type)? -- tip of the fruit didn't seem hot... As I sliced a couple more slivers closer to the membrane, the third slice hit me pretty hard. 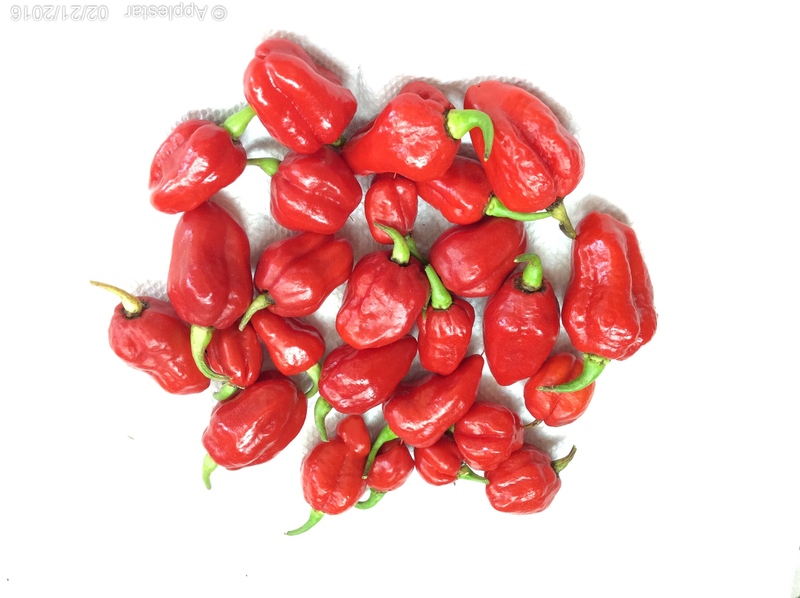 I'm not used to seriously hot peppers, so I can't tell if that means this is a crossed/not-true-to-type Bhut Jolokia, or the "Seasoning Naga" which is supposed to be "less hot". 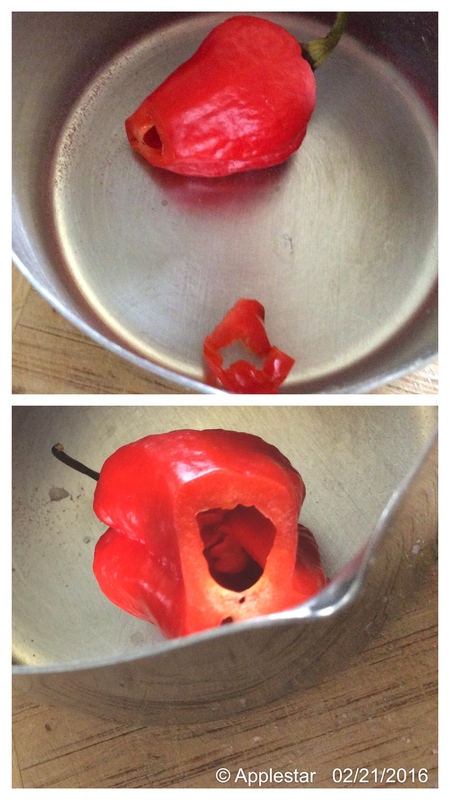 (I accidentally mixed up the three seeds I had -- Bhut Jolokia, Seasoning Naga, and Peach Bhut, so it should be one of the three if true to type. 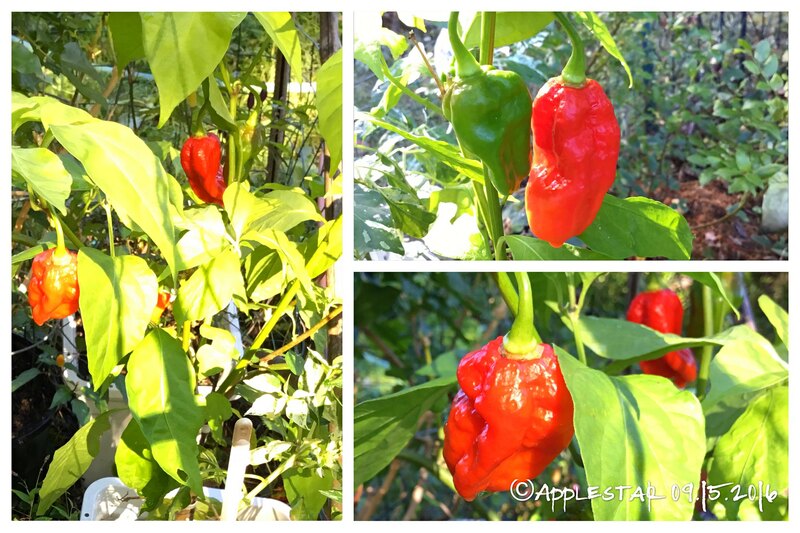 They look similar enough to me to be one and the same; my bhut is FINALLY setting fruit (doesn't like our until now lack of hot weather - we're finally getting our Summer here, lol) and so far, they are ribbed but smooth. Maybe the develop their wrinklyness as they grow? They are about half size now, me thinks. 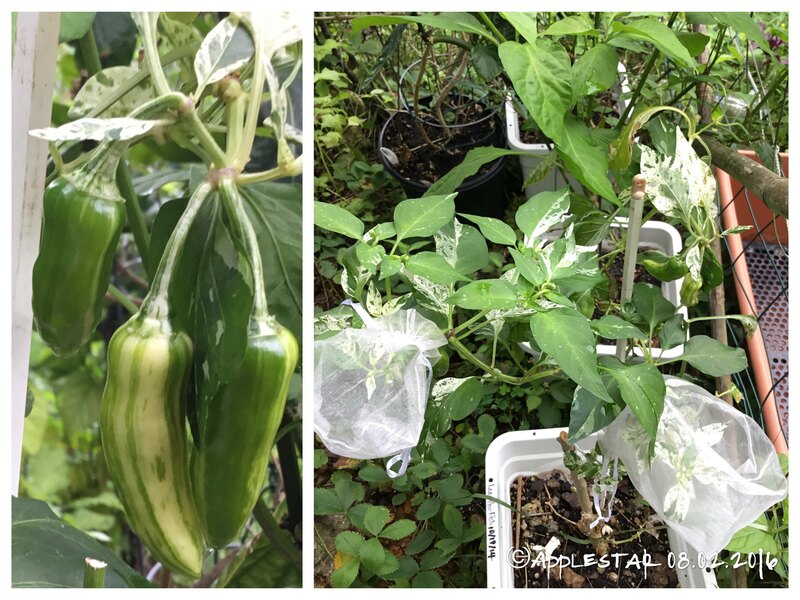 Three Fish pepper plants from my supervariegated selection in the same pot. 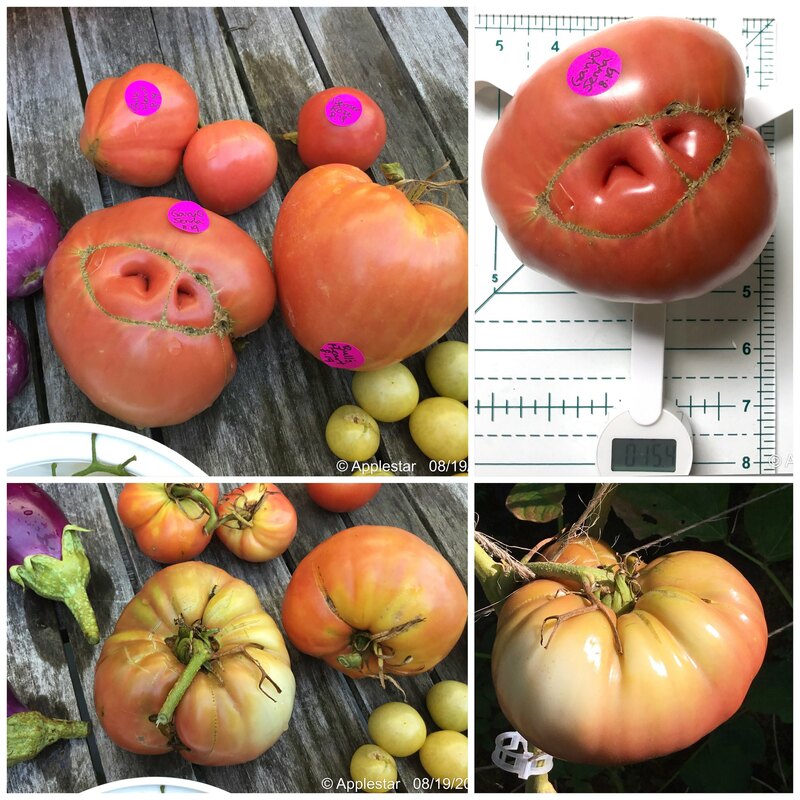 The front-right (from labeled edge) original mother plant has been over-wintered is several years old, other two were grown from her seeds last year. Mine are still completely green, lol! But today its in the 80's, finally, and supposed to be hot-ish weather for a while. 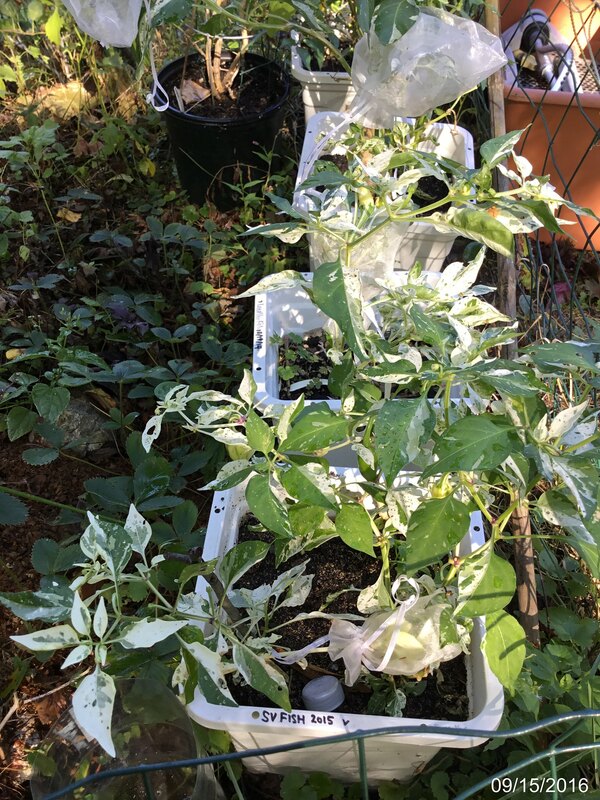 I have never seen a variegated pepper plant, so thanks for the photos of yours - wouldn't it be neat if the peppers were variegated too? They ARE. ...TO DIFFERENT DEGREES. 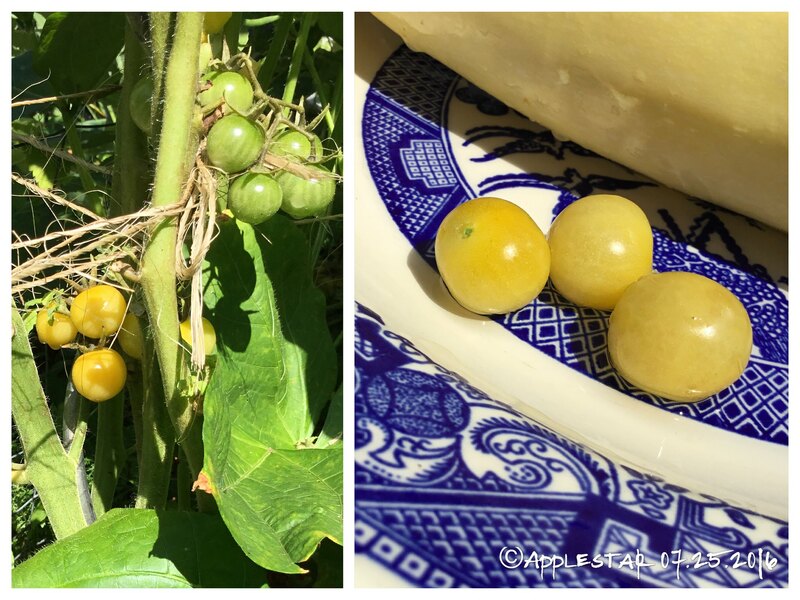 My SuperVar selection often produces nearly white fruits. 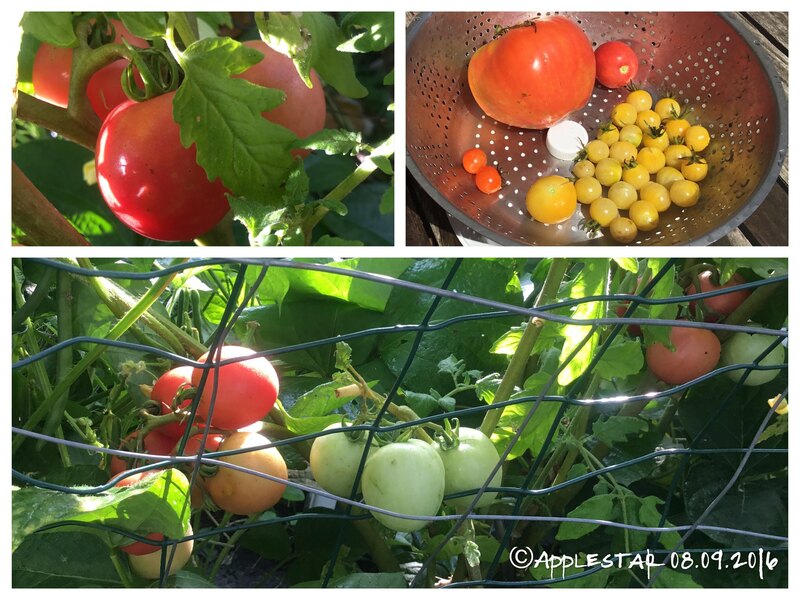 But they do ripen to red, except the green parts are red-red and white parts are different shade of red if you look closely. applestar wrote: Yeah, I'm not sure how healthy SuperVarX 2015 is. So far seems to be doing OK and is starting to grow floral trusses. Do you suppose it needs more fertilizer because it doesn't have as much chlorophyll? For comparison, here is the LeastVar (out of the three plants with SuperVar. MedVar kicked the bucket a couple of winters ago). 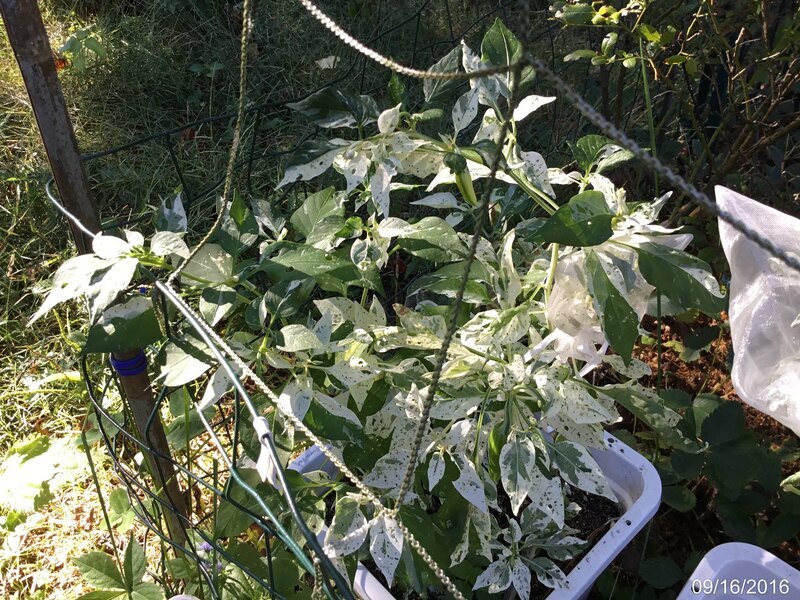 It started to grow much more variegated foliage ...last year? The year before? And hasn't gone back to the solid green fruits. But it still tends to be taller/lankier and more productive than SuperVar. I'm waiting to see if it grows any more yellow-orange fruits, which might have been a sport. I had almost given up on him, but it turns out my Charlie Chaplin is ALIVE! This pepper is called Sweet Chocoloco. A new variety that is still being developed. I'm hoping the one I have has the correct characteristics. So far so good with the dark immature color that should change to rich chocolate brown color then red. 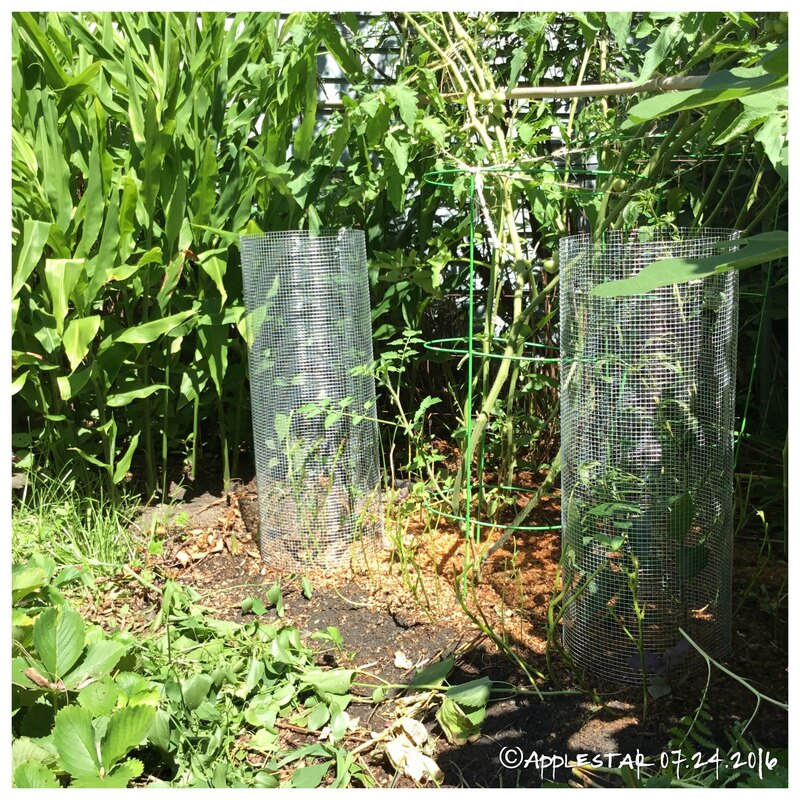 Now that it's cooler, I'm going to try to bag the next truss for seed saving.